Along with an interest in herpetofauna management, Auckland-based ecologist Samantha King is a talented photographer. 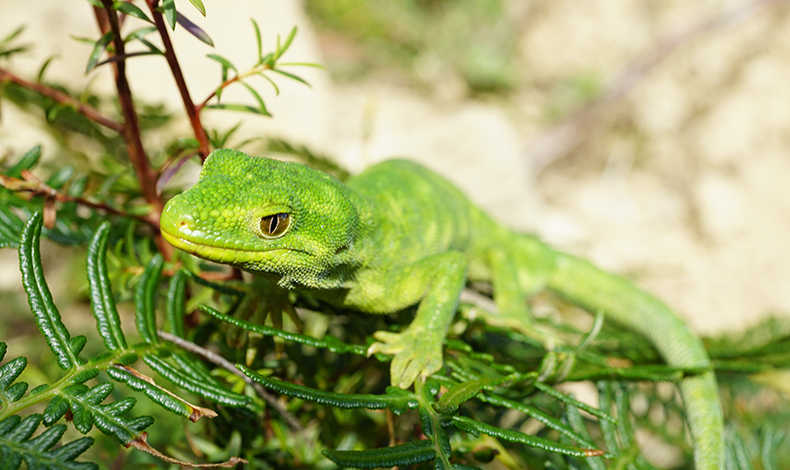 She captured these shots of a Nelson Green Gecko, also called the starred gecko, (Naultinus stellatus) while working on a project that’s part of the wider Nelson Nature plan. Sam and other ecologists are looking to identify remaining habitats and population for this gecko around the Nelson region. The goal is to provide Nelson city council and other stakeholders with a set of guidelines and advice to protect these geckos and prevent any more decline in habitat throughout their range in the region. Wild starred gecko give birth to one or two live young in late summer through to autumn. DOC classify the species as ‘nationally vulnerable’ with a population of 20,000 – 10,000 mature individuals and a predicted decline of 50-70%. Starred gecko are diurnal (active during the day) and arboreal (tree dwelling), inhabiting scrubland and forested areas, in particular occupying the foliage of trees and shrubs, including manuka and kanuka trees.